Me: What should I write about on my blog today? Me: Really? You never want me to write things about you. Me: Fine then. I'm going to write things about you. The first thing to know about my husband is that he has very wavy hair that he almost always combs straight. I don't know why he does this. Maybe because he tries to look like a respectable member of society, but wavy hair can often say otherwise. His hair looks very good wavy. I tell him this, but he doesn't believe me. I don't know why he doesn't believe me. I'm right about almost everything. This is my husband before I knew him. 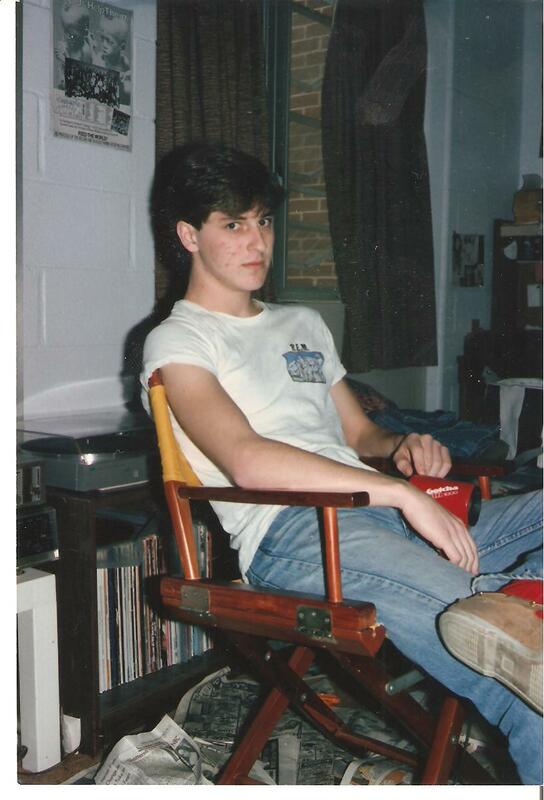 I don't know how old he is here. All I know is that our oldest daughter also very frequently gives me this look when she thinks I'm being ridiculous. I pity whoever it is who was taking this photo. 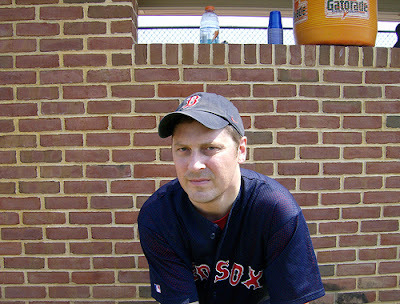 This is my husband when he used to play men's adult league baseball. If my husband looks serious about baseball here, it is because he is serious about baseball. and got lectures about hitting the cutoff man. One time, I drove my husband to a field in the middle of February in the middle of North Philly so that he and his friends could begin spring training. They shoveled snow from the field so they could practice. That was the day their pitcher broke his arm because it was spring training and these guys took baseball very seriously. Someone was bound to break an arm. Can I tell you how many Saturday mornings I've spent in dusty fields somewhere in Philadelphia watching a bunch of guys playing baseball and yelling at each other in English, Spanish, and Italian? Lots. Lots and lots and lots. 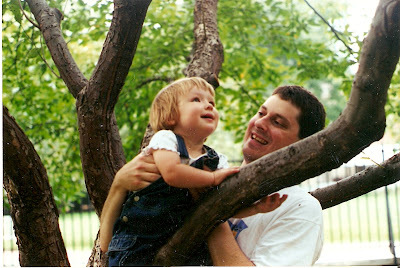 So many that even though my husband hasn't played baseball in years, I can still most likely get him to do things for me by saying, "Remember all those times I sat in dusty baseball fields in South, North, and West Philly - AND New Jersey - watching you play baseball?" And I could still be owed one. However...I don't do this. My husband doesn't play baseball anymore, even though I know he really wants to. When you have lots of kids, some things get put away. He put away baseball. But...I'm thinking he should play again. He's a pretty good shortstop. And someone has to remind people to hit the cutoff man. 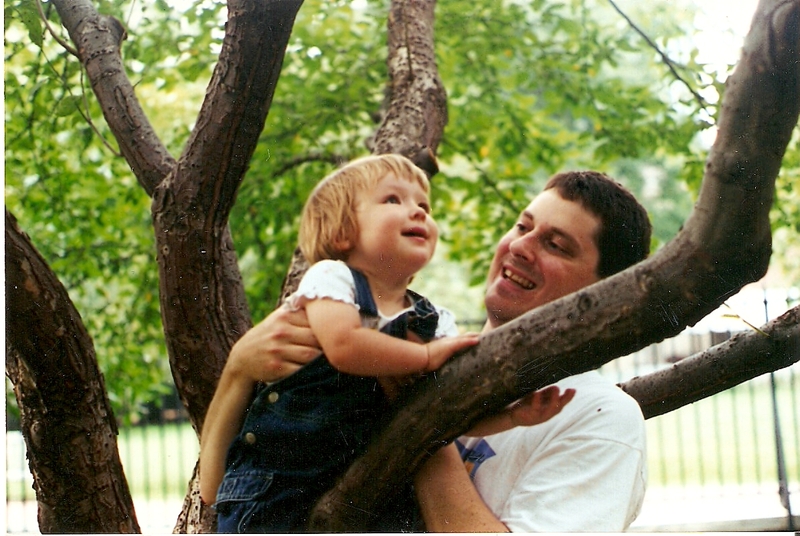 This is my husband with our eldest daughter. Which is wonderful, because I am not as good with toddlers. And it helps if at least one parent is. 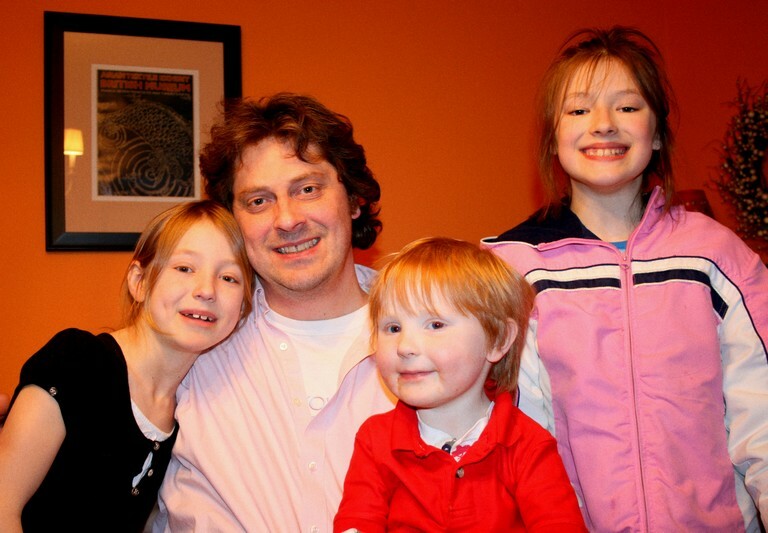 Here he is with all our kids. All of our kids got his intelligence and athletic ability. None got his wavy hair. I met my husband at the birthday party of a mutual friend. At the time, my husband was wearing a bright yellow raincoat. I don't have a photo of him wearing that raincoat, so this photo of him in a turkey hat will have to do. I spent the evening talking about being an English major in college. He listened to every word. Or maybe he faked listening to every word. All I know is that a lesser man would have politely excused himself and gone to search out a drunk girl dancing in a corner. At around four in the morning, he asked me for a ride home. I drove him home through the empty streets of Philadelphia in my Dodge Colt and the entire time I was thinking, "Uh-oh...I bet he's going to try to kiss me goodnight." 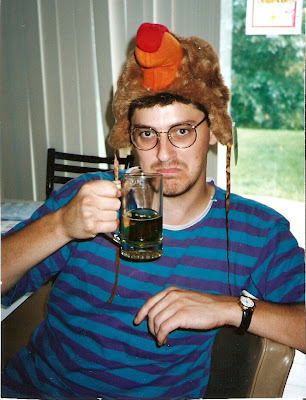 I bet he didn't know I'd have a photo of him in a turkey hat posted on my blog twenty years later. This is my husband on top of a wintry mountain with our red-headed baby. That night I drove him home through Philadelphia, I bet he didn't know I'd have this photo, either. 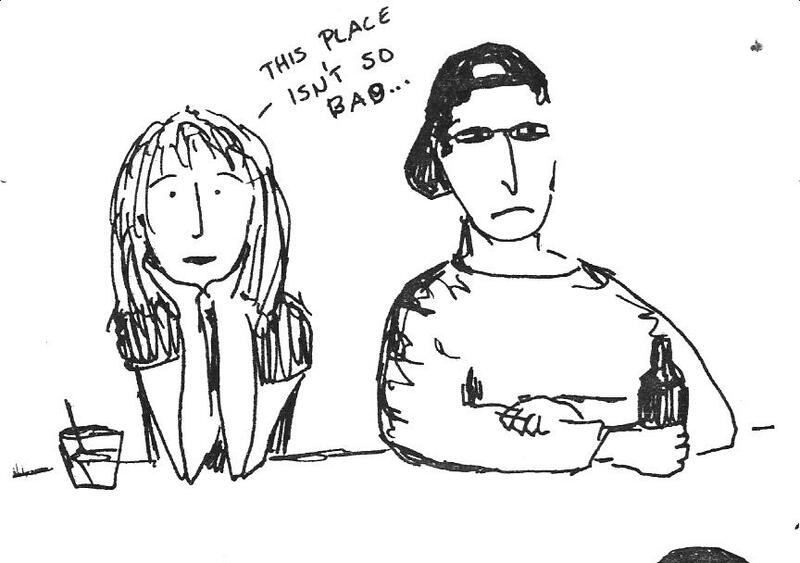 This is a drawing of my husband and me on a date at Silk City Bar in Philadelphia. For about a year or so, we spent almost every weekend at Silk City. We spent a lot of weekdays there, too. We listened to Frank Sinatra. We listened to Deee-Lite. We listened to 808 State. We listened to U2. During these dating years, my husband used to wear his hat backwards and drink Rolling Rock in pony bottles. There is a number "33" on the Rolling Rock bottle. This was also my husband's baseball uniform number. This was all just a coincidence. I think. 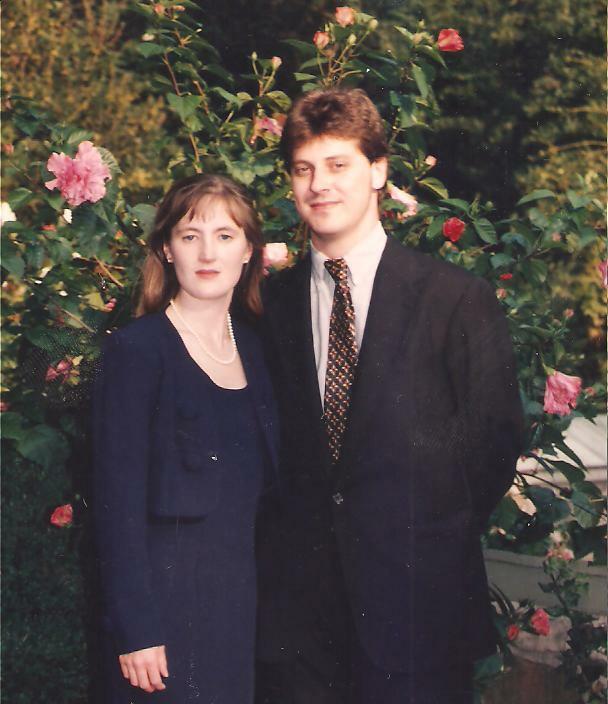 In 1996, we got married and my husband started law school and we didn't go to Silk City as often. Law school puts a lot of things behind you. Or...if you plan on graduating law school, you have to put a lot of things behind you. 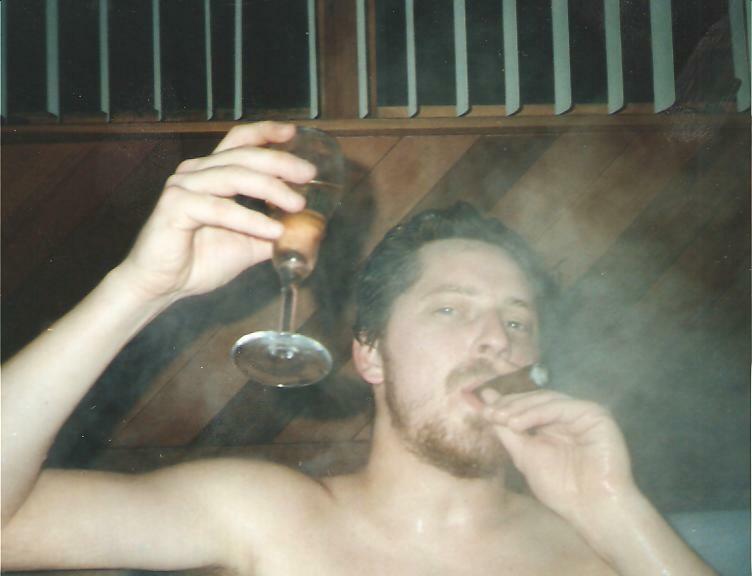 This is my husband with a glass of champagne, smoking a cigar, in a hot tub at a ski lodge in the Poconos. 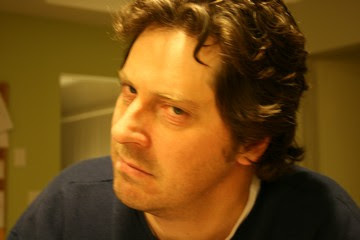 My husband is a joie de vivre kind of guy. And even though he and I are now respectable members of society, we neither of us turn down invitations to hot tubs and champagne and cigars. Think of us when planning your next night of low-level debauchery. Here we are at someone else's wedding. Someone at the wedding asked me if we were brother and sister. We do sorta look alike. Except, of course, I'm better looking. Or, I would be...if I had wavy hair. And those are some things about my husband.